This is the 2015 Head to Head "Losers Lounge". A place to hang out for those knocked out. I havent lost in this H2H contest, (like you did;-) because its hard for me to plan chopping these days. If you want to I can do a battle with you, in the loosers lounge. I think your idea (Loosers lounge) is funny. Funny image you've found also. Whats the rools in this game and what is the timelimit? The loser lounge chop was one i did in the 2008 h2h contest. Actually haven't they told you the first ones out are the winners, let the other guys keep struggling along working their skinny fingers to the bone. While you winners get to sit back and watch the show, they are working so hard to put on! There is only one actual loser the one for whom it takes the longest to get out of this race/contest! Ok, sorry. I see why you did win with that image back in 2008. Its great! You wanna play in the losers lounge? Against me? The same mage as the image in round 3 and we post the same time as the people that are in the H2H contest. ok? You wanna play dbbowling, like you asked for? I have made my image dbbowling. Are you ready? We have to wait till the 3 round starts. Ok? Maybe the site should have additional option for similar cases. "One on one" kind of arena open for voting with random source image where two choppers can settle their differences if wanted. Anyone else that want to join a battle against me in this lounge? Good luck to all the ones who made it to the next round safe. 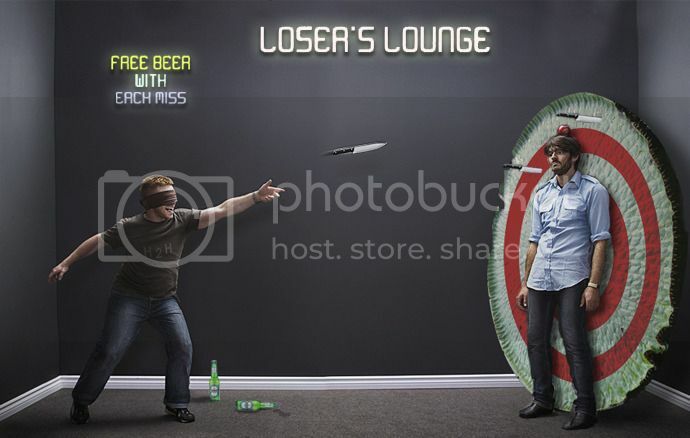 For the last time: anyone out there in the PSC.com world that will join this battle against me in this Losers lounge? A battle beside the main H2H contest. Anyone? As earlier informed, I have not participated in the H2H contest, I just wanted to compete against dbbowling, but he suddenly dissapeared from this site. I will, as told before, post my image at the same time the main H2H contest starts. Oh man, what happened? when did you get so bloodthirsty? I was so impressed with the near-tie voting between TheShaman and me in the second round, I was seriously wondering what would happen if we did tie. (Oh, and I was robbed mutter mutter yadda yadda the usual). I WILL BATTLE YOU IN THE LOSER LOUNGE....ROUND 3!